(Video on Demand, June 2015) There’s a fundamental miscalculation in casting blue-collar persona Mark Wahlberg as an academic, let alone a novelist teaching English Literature. Fortunately, The Gambler is about, well, a gambler: someone so addicted to the thrill of gambling that he has embarked on a one-way trip to self-destruction. That’s the part of the role that Wahlberg seems to be interested in playing. Never mind the ominous hints that this is a thriller – The Gambler is best understood as a character study, with mild threats and unsolvable debt problems thrown in. Is it successful? Partly so: It’s often interesting to watch, features a great scene-stealing turn by John Goodman, coasts a long time on the inherent tension of being indebted to unsympathetic people, and some of the cinematography is quite nice. Still, there are a lot of parts to The Gambler and they don’t necessarily fit together very well. The protagonist goes out of his way to be self-destructive, which doesn’t help in establishing audience sympathies. The romantic sub-plot isn’t handled particularly well, as are the familial complications of the story. The ending abruptly remembers that there is a semi-criminal thriller element to the film and wraps up quickly (followed by a semi-ridiculous run out of downtown Los Angeles). 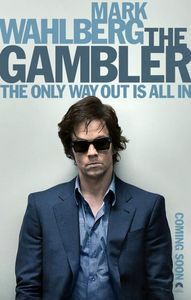 It’s hard not to feel that, as interesting as The Gambler can occasionally be, it could have been made stronger and more memorable with a few changes.